I have been invited into a number of environments to create site-specific works. These have been either a personal response to a place or process-based pieces which provide a framework within which people collaborate to make something much larger than themselves and enjoy developing their own skills alongside mine. 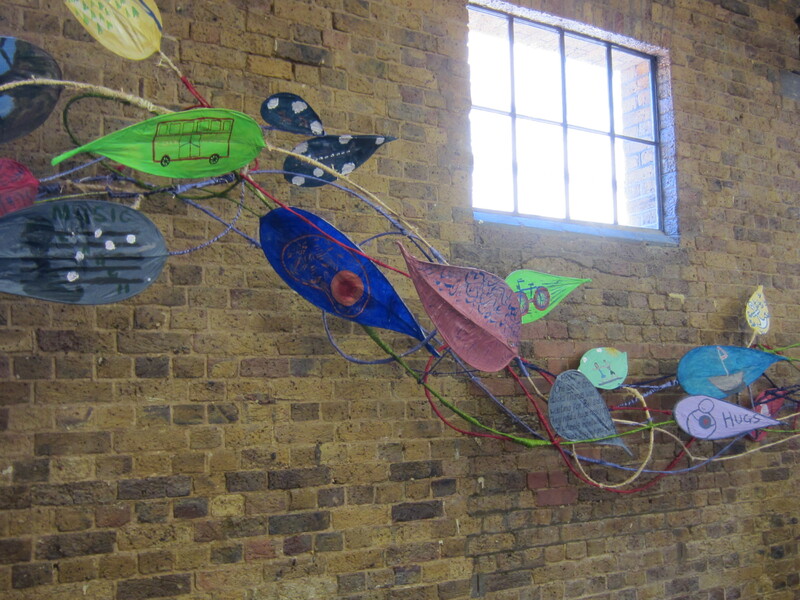 Seven-week residency at the City & Hackney Carers’ Centre, working with a wonderful group of adult carers to create a collaborative sculpture for the building . The project was initiated by Create (Arts) Ltd, with sponsorship by the City law firm, Reed Smith. 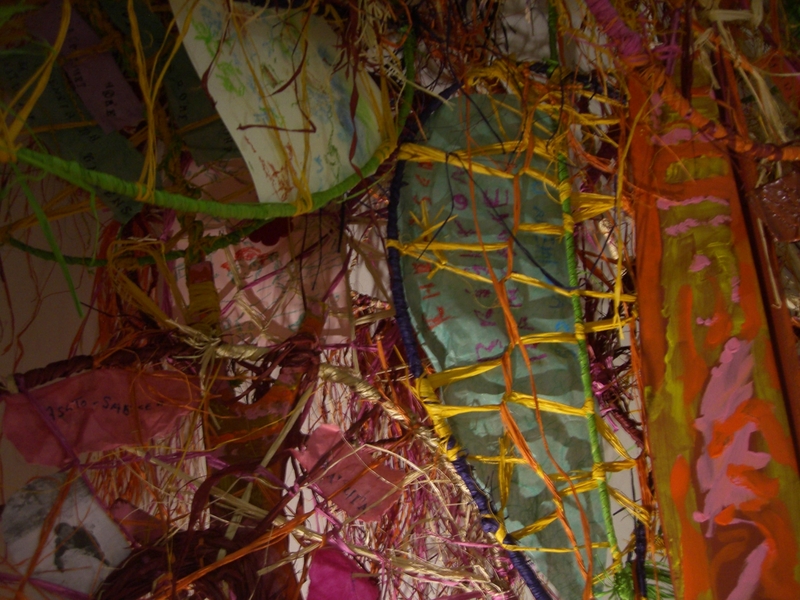 Using the theme of “Seasons of Life”, we explored explored a variety of 3D construction techniques and media, culminating in this undulating matrix of willow and raffia, bearing images which express the of the highs and lows of life as a carer. I designed the weekly workshops to develop the participants creative thinking skills alongside their “making” skills. This was an essential part of the process as it was important that final sculpture carried real meaning (personal and universal), as well as being decorative . “The Memory Tree” Mixed Media. Dimensions: width 1.5m x height 2.5m. 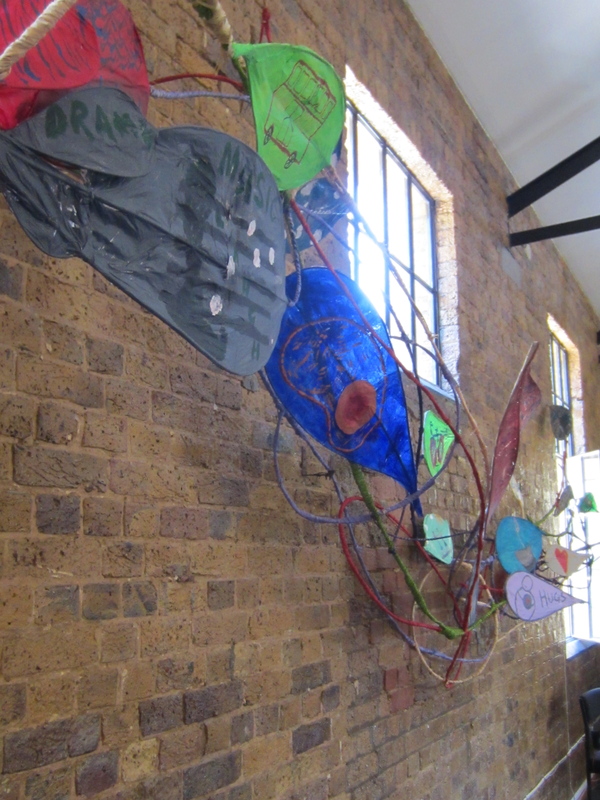 Site-specific sculpture, made in collaboration with a group of over 65’s who attended the Centre. As the artist on the project, my brief was to find a concept that was relevant to the location and stimulating for for group I would be working with. I then had to design and build a series structures that would provide a framework within which each participant could explore their own creative ideas. 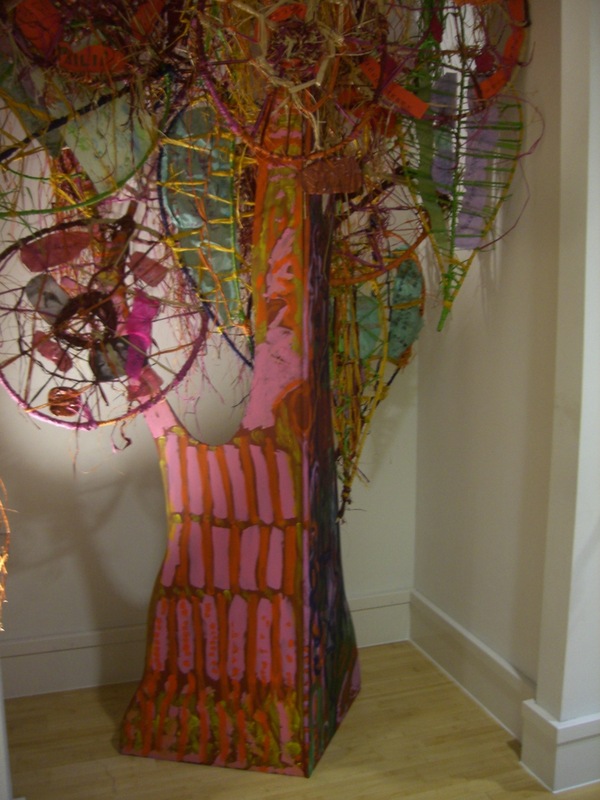 The resulting tree, made from wood, willow withies, woven raffia and other media, incorporated images of people and places that are significant in the lives of those that made it. Both the form of the Tree, and the weaving and collaborative processes involved in making it, were metaphors for the myriad connections and growth that define our lives. 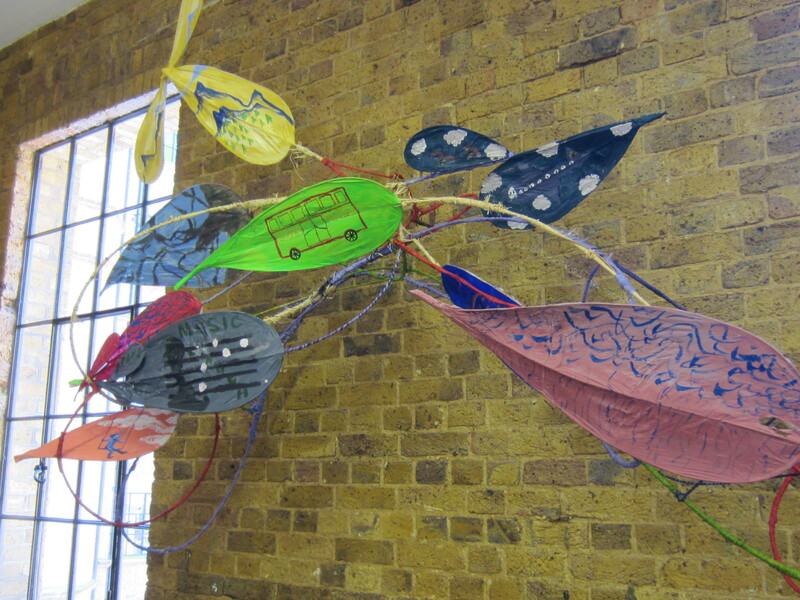 The final sculpture grew out of series of drawing, weaving, mixed media and painting workshops. The majority of the participants in the group were suffering from various degrees of age-related physical and mental disabilities. An important aspect of the residency was reconnecting these people with a sense of own creativity and improving their motor skills. For the SW1 Gallery, Victoria, London I was invited to create sculptural projects for SouthWestFest (London Borough of Westminster Annual Arts Festival) 2 years in succession. I used the ideas I was exploring in my own practice (slotted sculpture that can can be assembled and dismantled like flat-pack furniture) to initiate the concept for the structures: discs or squares of cardboard, which provide a surface to carry an image. 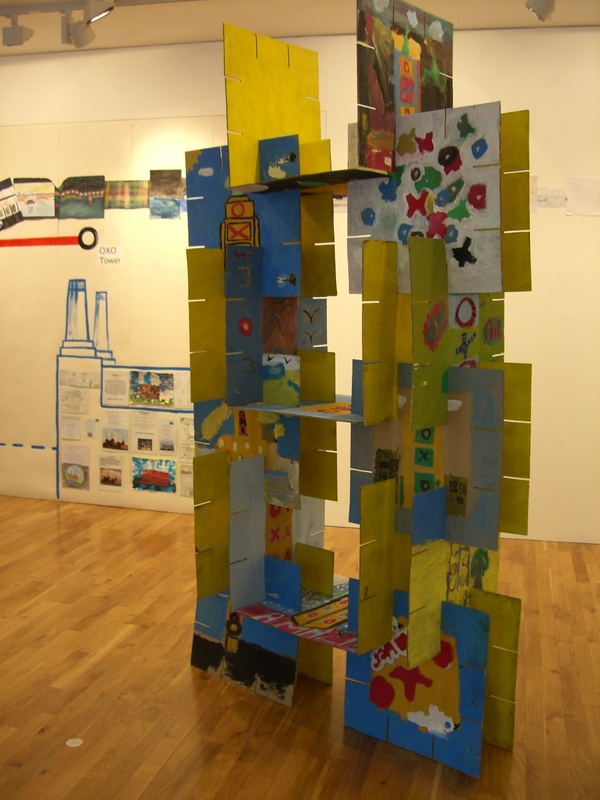 In 2006 I devised the project around the theme of “Landmarks“. 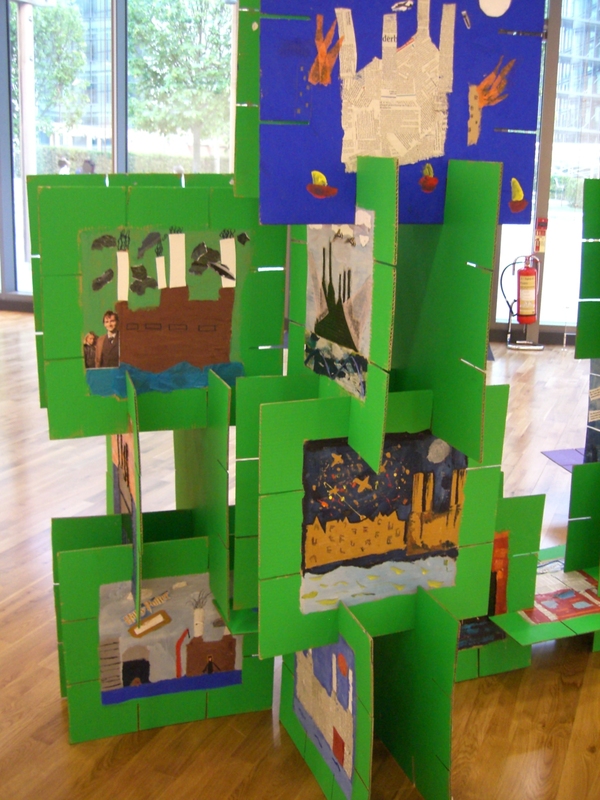 Working with six local schools, each group chose a key landmark in Westminster, from the Oxo Tower to the River Thames, to research and draw/paint. The finished artwork was mounted on large cards, which I slotted together into architectural forms. I incorporated the research into a giant map of the relative locations of the landmarks to provide a contextual setting for the 3-dimensional structures. 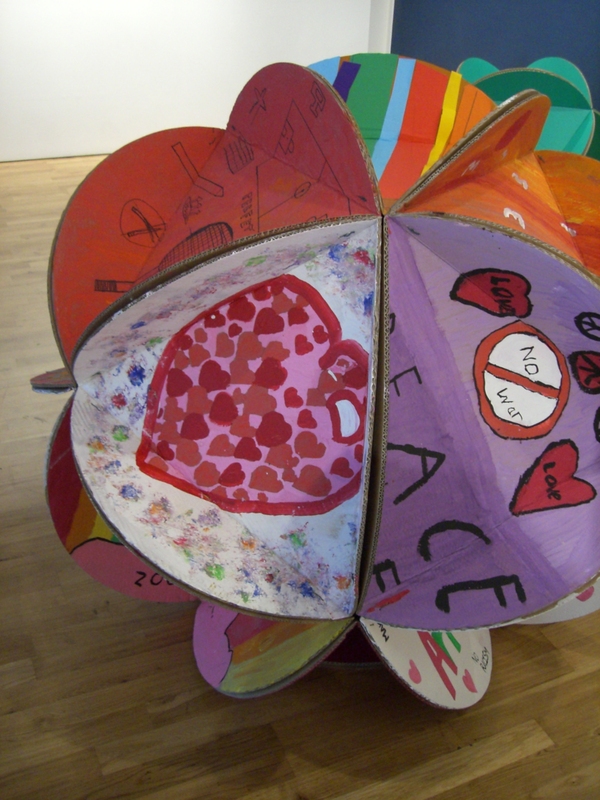 In 2007, I created “Perfect Worlds“, again in collaboration with children and young people from local schools. The theme encouraged them to express their thoughts on how they would like their world to be. I created an exhibition of all the visual and written research work produced during the course of the project to provide a setting for the giant icosahedrons I built from cardboard discs covered with the finished artwork. “Visual Dominoes” Mixed media on cardboard. Interactive art “games” designed to invite the participation of gallery visitors of all ages, and to engage with different types of creative process. The overall concept was a chain-reaction of ideas, each person inspiring the next. All the games lasted nearly three months, developing into works that incorporated several thousand contributions. 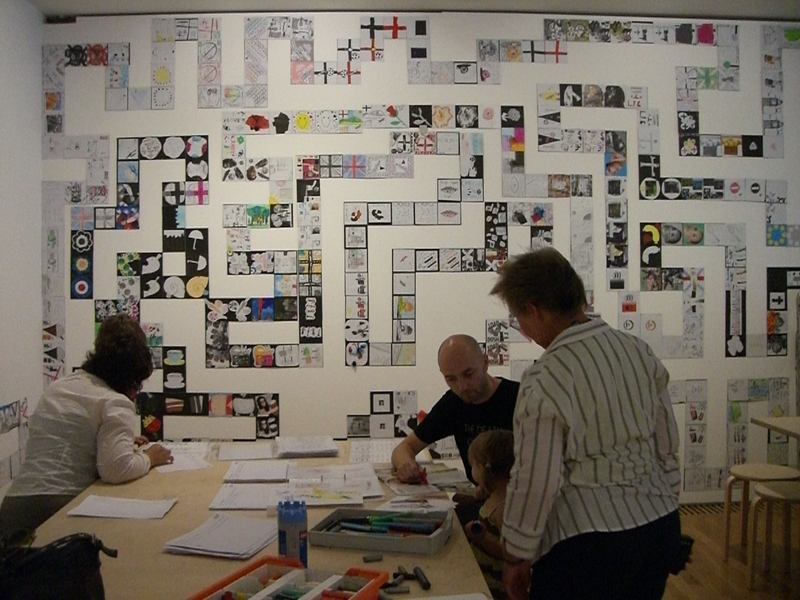 The key game was “Visual Dominoes”, in which the each participant drew or collaged a small image expressing an idea of ‘Englishness’, inspired by the image produced by the previous participant. 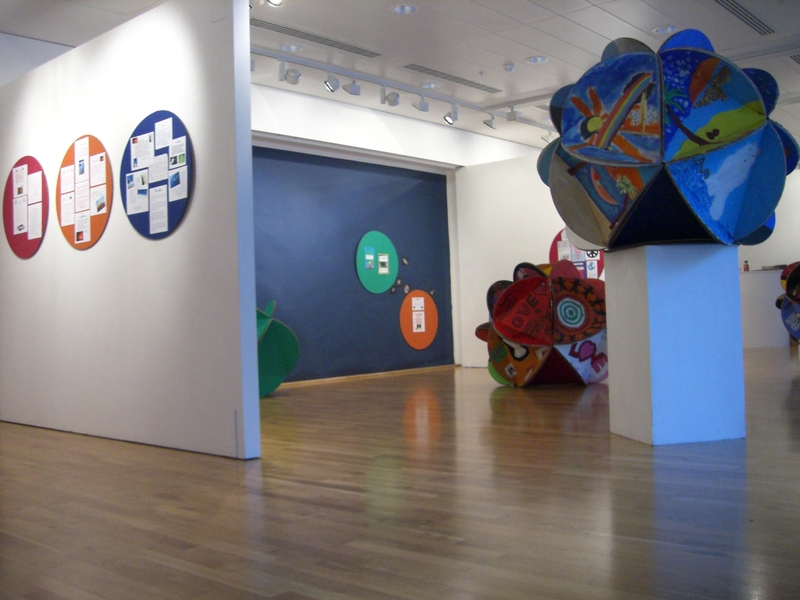 The images were copied and pasted on to black cards, like giant dominoes and displayed the flow of ideas as they spread over the gallery walls. “Einstein’s Jigsaw” Acrylic and mixed media on wood. Dimensions: width 250cm x height 180cm. 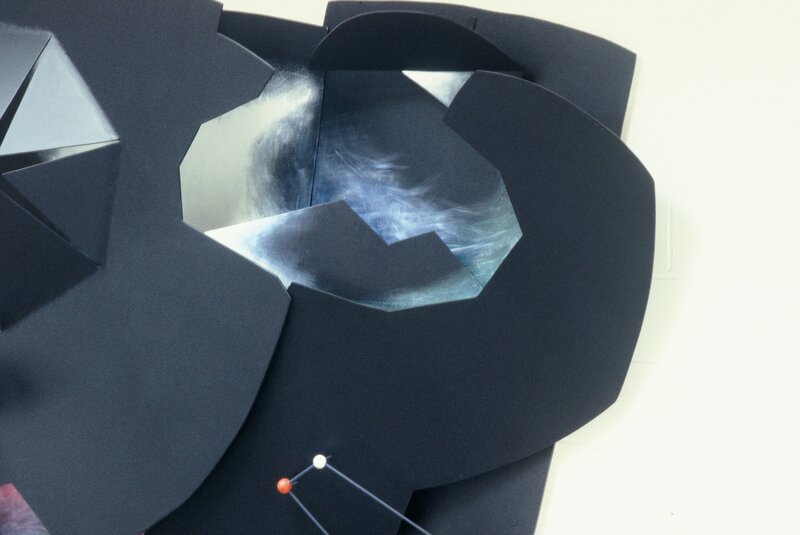 Site-specific wall sculpture experimenting with ways of giving physical form to “space” and dark matter. Two well-known scientific equations were embedded in the design, written in constellations, as a contemporary take on how we project our interpretations onto everything we see, as in the past, humans joined the stars together to create the shapes of their gods. 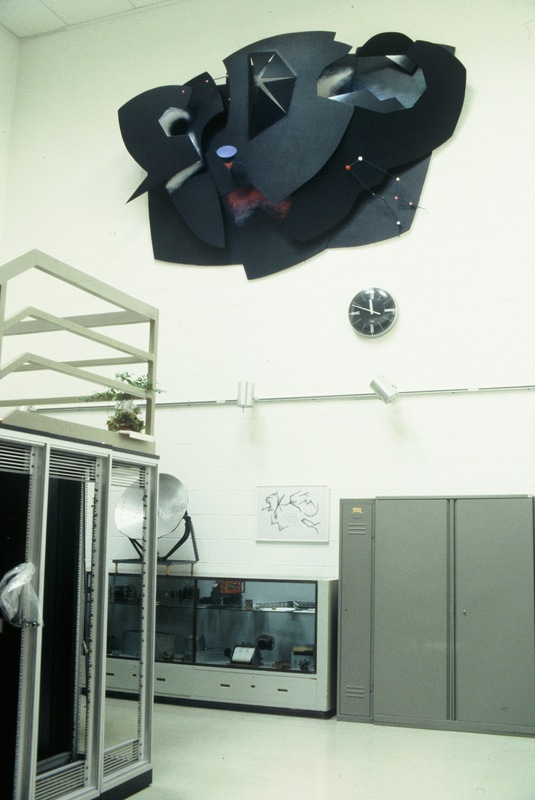 As well as engaging with ongoing research at the Observatory, the sculpture also incorporated scientific discoveries made during its history, for example, the discovery that the distant galaxy, Cygnus A, was the brightest extragalactic radio source in the northern sky. It is represented as a spinning top, an image suggested by Professor John Baldwin’s own metaphor for the behaviour of a radio galaxy.